Documentation » Questions and Answers » How does LibX’s update mechanism work? How does LibX’s update mechanism work? 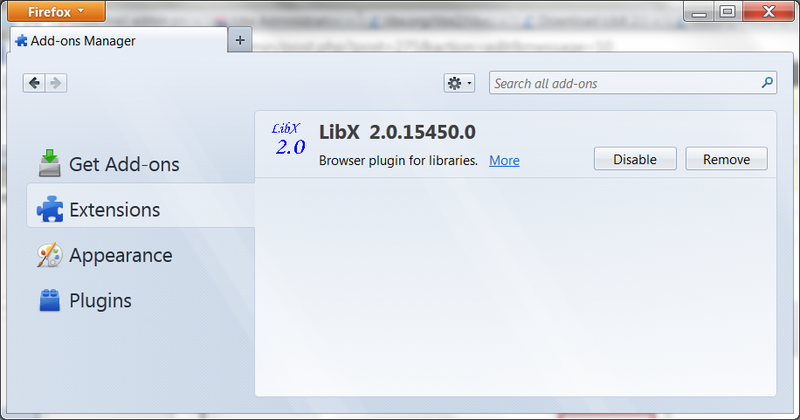 In LibX 2.0, updates to edition configurations, LibApps, and to the LibX plug-in itself are separate. When an edition maintainer makes a new revision of an edition live (see edition ids), the configuration associated with that revision will be activated. Users who have this edition activated will pick up the new settings, which should happen without 24 hours, though not immediately. This delay occurs because we have no way of tracking who needs an update, so each machine that has LibX installed needs to contact the libx.org server for updates. The LibX update scheduler spreads out such updates. Please let us know if this update mechanism fails for some reason. If you need to activate a configuration change immediately, check the ‘Show Developer tab’ box, as shown above. A tab ‘Developer’ will appear, as shown below. Click ‘Clear Cache’. When you open the popup the next time, the new settings should appear. Note: when testing a new revision’s configuration via the edition builder, the new settings are automatically activated while working with the edition builder, as described here. Each LibX user is subscribed to a number of LibApps, which perform certain actions on pages the user visits (such as autolinking). By default, all users are subscribed to the LibX Core package, which is provided by the LibX Team and contains a number of general-purpose LibApps. Edition maintainers may subscribe their users to additional packages using the edition builders. Users may subscribe to additional packages through the Preferences panel. All packages and LibApps a user subscribes to can be enabled/disabled by the user. Packages, LibApps, and the Modules of which LibApps are comprised are published using AtomPub feeds. For efficiency, multiple packages, LibApps, and/or modules may be combined into the same feed. LibX checks regularly if the feeds containing the packages a user is currently subscribed to have been updated and if so, rereads them. If you need to force a manual update, clear the cache as described under ‘Updates to Edition Configurations’. Updates to the LibX Plug-In are distributed by us, the LibX maintainers. They are digitally signed and distributed via the Firefox and Chrome browser’s extension update mechanisms. In Chrome, use Tools -> Extensions and check the box ‘Developer Mode’. To see if you have the most-up-to-date version of the LibX code, look at the version number. In the screenshot below (taken May 3, 2012), that’s 2.0.15450.0. 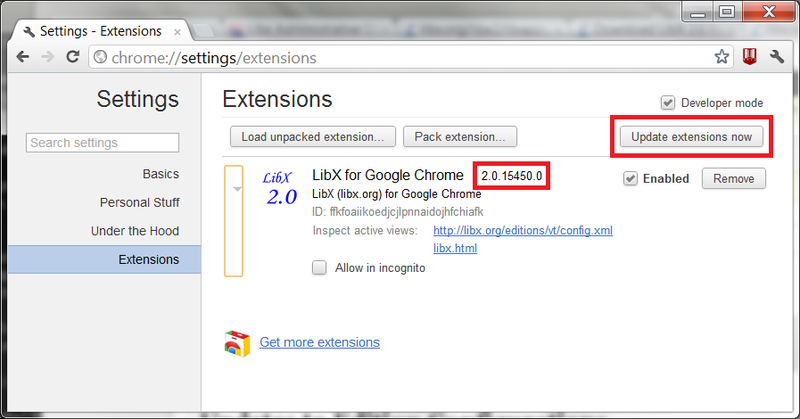 The LibX Download Page lists the most up-to-date version of LibX. You can also try pressing the ‘Update extensions now’ button and see if the version number changes. In Firefox, select “Firefox -> Extensions”, which shows the version number of the plug-in you have currently installed.